Friday Faves Inspiration: Halloween special! Friday on the blog is always all about the beautiful homes I've been crushing on recently, and every week I'll be running my Friday Faves - featuring a few of your beautiful homes and images I've been drawing inspiration from over the past few days. 1. First up this week is this amazing display from @littlehouse_on_the_hill! How lovely does this look?! It looks really spooky and halloween-y, but I love how she's tied in some autumnal decor too with the conkers in the pretty jar. I especially love that bat! 2. 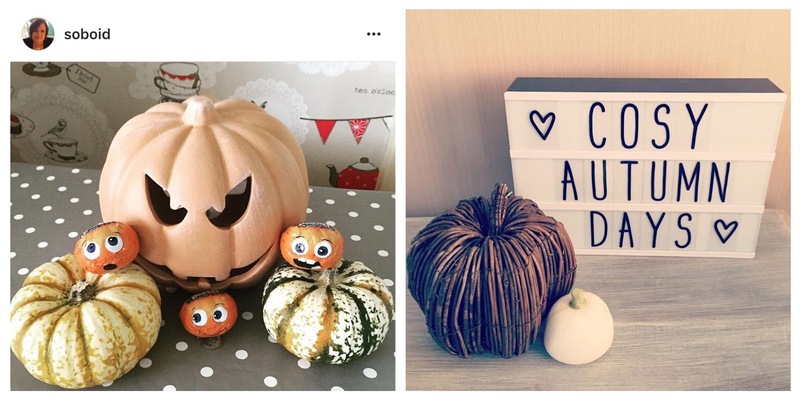 Next up is Nicola (@myhome_nicola.x)'s amazing pumpkins! I'm absolutely awful at carving pumpkins, so I'm amazed at how neat these look. How funny is the middle one too?! What a hilarious idea! They look so spooky, perfect for scaring trick or treaters! 3. 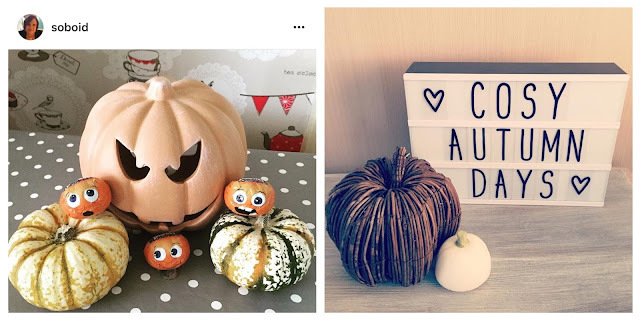 How lovely is @biggs0902's autumnal pumpkin display?! I absolutely love these different coloured pumpkins, they really add something a bit different. I also really like the idea of collecting up pine cones and displaying them like this - I made one similar the other day (have a look at my DIY Autumnal Display post here). 4. 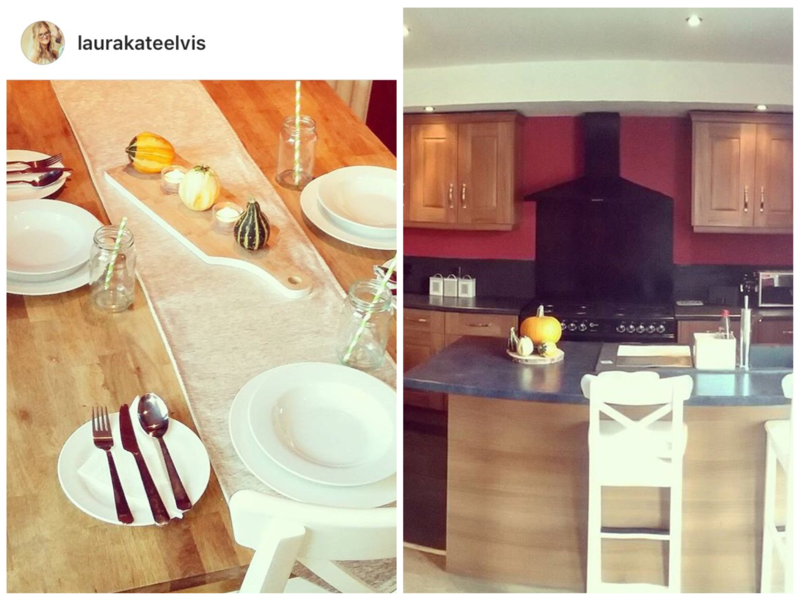 Next up is @laurakateelvis who has shared two pictures! I love her beautiful table setting - how cute are those jars as glasses?! I also love the display of mini pumpkins, so simple but looks amazing! She's got one in her lovely kitchen too - so jealous of that gorgeous island! 5. How pretty is @vee_murr's front door?! I wish the entrance to my house was this neat and tidy! I love that she's added a couple of Halloween touches here, but kept it simple - I think those are little pumpkins added into her tree! What amazing attention to detail! 6. This next one is a lovely display from @athomeinhoneyfields (how dreamy does honey fields sound?!) - I absolutely love this, especially those beautiful silver pumpkins! How wonderful is her framed print about fall too - it lists all the things I love about this season! 7. I'm not a fan of carving pumpkins at all, I can't bear the sloppy insides and always make such a mess of it, so I absolutely love the idea of getting some ornamental pumpkins that can come out every year, just like @soboid! I've never seen a wicker one before either, how lovely does it look here with her light box?! Also the little pumpkins with faces are the cutest things ever! Definitely going to have to invest in some of those for next year! 8. How gorgeous is @karlaandeva's home?! 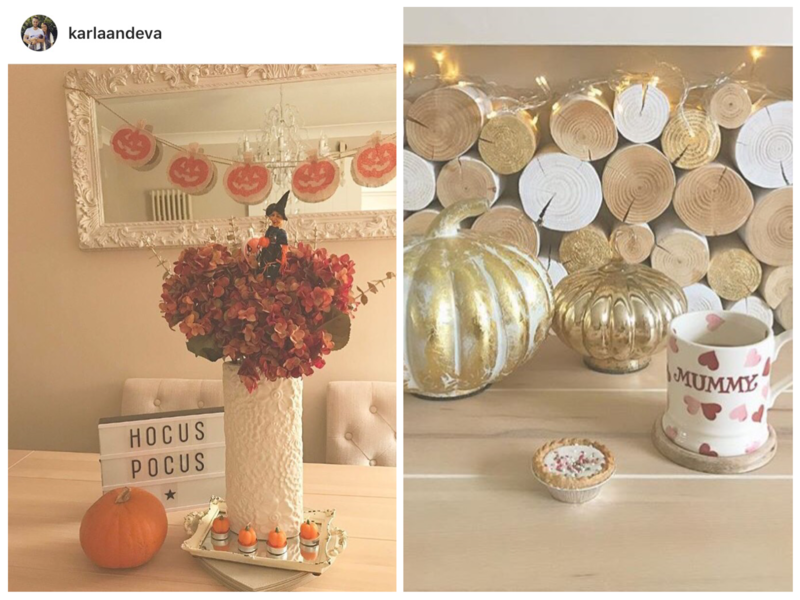 I'm so in love with those gold pumpkins, and how she's mixed Halloween decorations with autumnal flowers, creating the most beautiful display. Also, not really related but I'm obsessed with those fairy lights/logs in the background! Makes me wish I had a fireplace so I could do something similar! 9. And finally, @ournewbuildjourney has shared this lovely picture of their Halloween display - how big is that giant of a pumpkin?! I love the different sizes and colours going on here, such a simple display but works so well. I also love the fact that they've included some sweetcorn in there too, perfect for creating more of an autumnal feel - made me think of harvest festivals! Hope this has provided you with some inspiration should you be thinking about decorating up for Halloween this weekend. Next Friday I'll be looking at your cosy corners! So don't forget to hashtag pictures of wherever you snuggle up on a cold winters eve (I'm thinking blankets, fires, candles, you name it!) over on Instagram #DoveCottageFridayFaves, and I'll feature some of my favourites next week!